Forbidden Procedure: Rebirth Ex Machina CLEAR! Grab Time to apply pressure! Breaking an infinite Let's wrap this up! Breaking an infinite Time for alternative medicine! 交代アンブレラ(未使用) Make them fear you, girl! 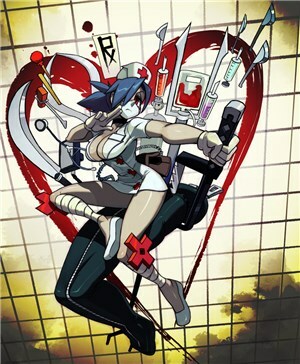 交代参戦 Is the patient prepped? ｱｳﾄﾃｲｸ Don't go too far! Ground recovery I've seen worse. Ground recovery That's... gonna bleed. Ground recovery I'll patch it right up! Opponent recovery Just pull the plug. Opponent recovery [Sarcastically] That'll heal! Opponent recovery Want a bandage? Opponent recovery Just a flesh wound. Stone cold... and red hot. vs Peacock I guess you're not so deadly after all. vs Double So easy to replace. vs Squigly Just another D.O.A.